TRIO Smartcal presents a new line of spectrum analysers, offering excellent performance in a 9kHz - 3GHz frequency range. Representing a mid-range spectrum analyser product, the ATTEN AT8030D is suitable for mobile communication bands such as CDMA2000 and WCDMA as well as RF systems such as broadcast, EMI and EMC testing. Its user interface is designed to simplify many of the measurements required for the evaluation of modern communications systems. 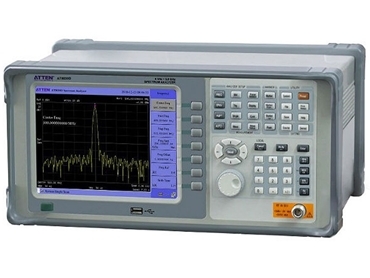 The 3GHz ATTEN AT8030D RF spectrum analysers are lightweight in design and feature a large 8.4-inch colour LCD display, a fast processor and high memory capacity enabling the storage of large amounts of screen traces and operational states. Measuring functions include frequency measurement, AM/FM demodulation, ACP measurement, chromatogram etc.